Kevin Wang is with Plug and Play Insurance, the insurtech vertical at Plug and Play Tech Center, one the largest global technology innovation platforms. Plug and Play insurance is a leading insurance innovation platform that has recently launched in partnership with Munich Re, USAA, State Farm, SOMPO Digital Lab, Farmers, Nationwide, Deloitte, Travelers, Aviva, AIG and many more global Insurance institutions. Kevin studied finance at Case Western Reserve University. He is a serial entrepreneur with a background in manufacturing and distribution, as well as strategy consulting. Technology in the mobility space has made travel safer, faster and more convenient. The results have been incredible: The Insurance Information Institute found a 33 percent decrease in automobile deaths in the past three years. The same survey found that nine models registered zero fatalities per vehicle per million. Mobility has also become more accessible with ride-hailing apps like Uber and Lyft delivering more than one million rides a day in more than 60 countries. Despite the upside, there are consequences to innovation. On May 7th of this year, a Tesla owner died while using the Autopilot feature. His vehicle crashed into a truck after his Tesla failed to differentiate the white color of the truck against the backdrop of the sky. This event may change the narrative and public appeal for autonomous driving. It puts into perspective how close the future actually is and whether or not society will fully embrace it. Autonomous driving promises to decrease the automobile death toll. Last year there were 35,000 automotive-related deaths, accounting for .01 percent of the U.S. population. While it may not seem like a high number, those deaths are the result of people, not an algorithm that holds a passenger’s life within its source code. This brings us to question the liability programmers and the code they write be given the power to determine life and death for consumers who buy their cars. And ultimately, who is liable in the case of an accident or even death? The next critical step is the proliferation of autonomous driving and the task of safely embedding its utility within the framework of our society. With these issues in mind, private companies and governmental agencies are taking appropriate steps to address them. Google has been testing and building a fleet of self-driving cars that have completed 1.5 million miles of road tests. In 2014, the U.S. Department of Transportation approved vehicle-to-vehicle technology that enabled vehicles to “talk” to one another and can help prevent human errors that often lead to collision. And this March, General Motors acquired a startup called Cruise Automation for $1 billion. GM was already on pace to launch a highway-oriented, smart cruise control system in its Cadillac CT6 line. Technological and governmental infrastructure for autonomous vehicles is well on its way to maturity. Driving technology may never replace drivers, but it could help us become less injury prone. But there are a number of factors that will decide whether the mass adoption of autonomous driving will actually happen. Consumer acceptance is one factor. Not everyone may want a self- driving vehicle. Americans actually love cars; Experian Automotive reports that each household owns 2.28 cars on average. If the idea of autonomous vehicles were to become widely adopted, the end user will eventually need to view travel and car ownership as separate concepts, a concept highlighted in Elon Musk’s master plan. 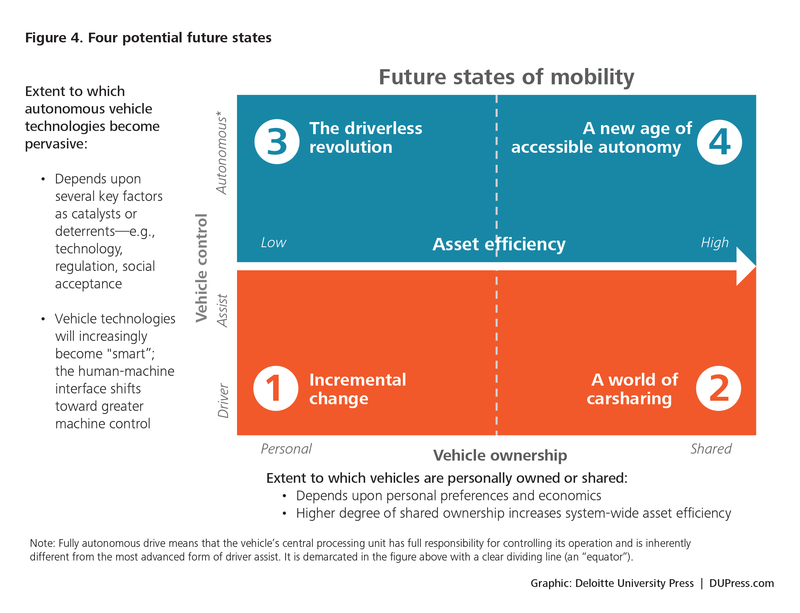 Deloitte believes there are four future stages of mobility: incremental change, car sharing, driverless revolution and accessible autonomy. The road that our current model is headed down is a driverless revolution, where consumers may still own their car but the vehicle will have the capabilities to operate itself. While all four stages may exist simultaneously, they may not necessarily distribute evenly among every segment of the population. The driverless-revolution stage may indicate incremental change from what we have now, much like GM’s new self-driving Cadillac technology. Accessible autonomy will impact auto insurance significantly. For starters, fewer accidents will result in fewer claims and less in losses for insurance carriers. David Zuby, EVP and Chief Research Officer at the Insurance Institute for Highway Safety stated, “Vehicles equipped with front crash prevention technology have a 7-15% lower claim frequency under property damage liability coverage.” This is a win-win situation; not only will technology prevent accidents, insurance companies will pay out fewer claims. Insurance companies will also need to develop new, innovative products before autonomous vehicles become widespread. Crash-prevention technology will play a huge role in lowering premiums during the driverless-revolution stage. Insurance companies will need to find new products they can sell. In the car-sharing stage, insurance companies sold gap insurance and ride sharing policies to companies like Uber and Lyft. Drivers needed coverage when they picked up and dropped off guests. The premiums from the new policies cost more, as well. Geico’s personal policies for a male living in Chicago would cost $1,140, while its ride-sharing policy for the same individual would cost $3,743. Autonomous car policies could follow the same pricing increase strategy. The Tesla incident may deter the public from fully embracing autonomous vehicles. Self-driving cars may never reach accessible autonomy and might only be an add-on feature. It is very likely that the driver will still be liable for the actions of their vehicles. This means that drivers will still need auto insurance. Driving technology may never replace drivers, but it could help us become less injury prone.